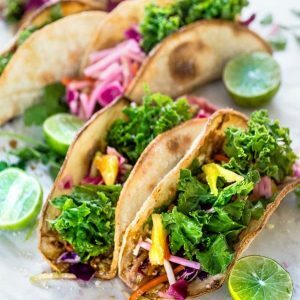 Tilapia and Kale Slaw Tacos make a light and healthy weeknight meal. Toasted tortillas topped with flaky white fish fillets, kale, radicchio, carrots, daikon and sweet pineapples. Marinate fish with lime juice, soy sauce, maple syrup, sesame oil and salt and pepper to taste. Cover with plastic wrap and set aside for at least 30 minutes. Meanwhile, whisk together the orange juice, sesame oil, rice vinegar and honey in a large bowl. Combine with kale, cabbage, carrots, and daikon and toss until evenly coated. Season with salt and pepper to taste. For the grill: Place fish on hot grill and cook for about 4 to 5 minutes over a medium-high heat. Turn once during grilling. For the stove: Heat oil in a large cast-iron skillet over medium-high heat. Add fish to pan and cook for 3-4 minutes on each side or until desired degree of doneness. To Broil: Preheat oven to broil or 500 degrees. Broil 7 to 10 minutes until fish is lightly brown and cooked through. Fill tortilla (toast if desired) with a portion of fish and then top with pineapples and kale slaw. Top with Sriracha (optional). A few avocado slices would work well in here too.